Silanes Market size was over USD 2.3 billion in 2017 and will witness a CAGR of more than 8% between 2018 and 2024. Strong rise in the megacities of emerging economies including Asia Pacific which involves rapid urbanization and infrastructure construction, due to growing urban population. These trends are probable to make notable contribution to the overall silanes market size in the coming years. For instance, construction in these economies is projected to reach USD 6.7 trillion by 2020, accounting for 55% of the global construction output. Product finds wide-ranging applications in the construction industry as it used in the production of variety of adhesives & sealants, fillers & pigments, paints & coatings, etc. Silanes are widely used in paints & coatings to improve adhesion to coated surfaces and bridge the interface between dissimilar materials. Furthermore, product is used in the production of fiber glass & mineral wool which are widely applicable as insulation material across construction industry, which will result in driving product demand, and thereby having a subsequent positive impact on the global market size during the forecast timeframe. Product is extensively used in plastic packaging industry as a mineral filler into polymer matrix which results in offering numerous advantages for the product functionality. However, rising paper based packaging material to reduce carbon footprints which is caused by plastic packaging material, is likely to hinder the overall silanes market size in the forecast time spell. However, rising R&D initiatives by the major market players which is helping penetrate the product across various end-user segment will offer plenty opportunities to the market size in the near future. Halosilanes/hydride functional silanes market size constituted more than 40% of the total industry share in 2017. Hydride functional silanes possess Si-H bond and have a limited commercial significance. Halosilanes are compounds having Si-X bond and possess properties of immediately igniting on contact with air. Commercially, three inorganic halosilanes namely tetrachlorosilanes, tetrafluorosilanes and trichlorosilanes are mainly produced. Silanes (SiH4), is considered to be the most thermally stable inorganic silanes. On the other hand, disilanes and other member of the binary series are less stable, and halogen substituted silanes are subjected to disproportionation reaction at higher temperatures. These compounds are widely applicable across various end-user industries including construction, automotive, plastic packaging, electronics, etc. in the form of fillers & pigments, adhesives & sealants, etc. Rising aforementioned industries will trigger product demand which will have positive impact on the global market size during the forecast timespan. Silanes market size for fiber glass & mineral wool is likely to grow at a CAGR close to 8% in the coming years. Product are widely applicable as adhesion promoter in fiber glass & mineral wool, which are widely used as an insulation material across several end-user industries such as construction, automotive, plastic packaging, etc. For instance, the strength imparted to the plastic by glass fiber is combined with silane-induced adhesion promotion to provide high profile properties of the reinforced materials. It results in providing superior properties to the final end-product which includes high elasticity, low weight, corrosion resistance, chemical resistance and excellent heat and sound insulation. Strong growth in the abovementioned end-user industries mainly in emerging economies will trigger product demand, which in turn will help attain significant gains to the overall market size over the projected timeframe. 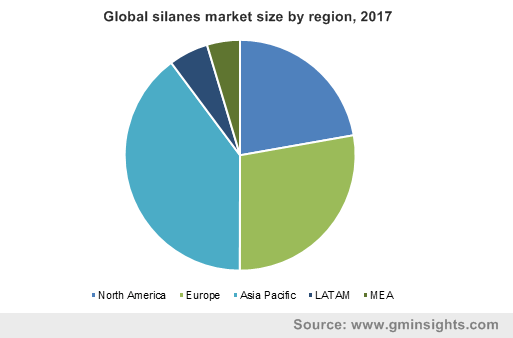 Asia Pacific silanes market size in 2017 was over USD 850 million and is probable to witness above average industry gains over the forecast timeframe. This is mainly attributed to the rapid industrialization and urbanization in the region, which has triggered product demand, owing to its wide-ranging applications as adhesives, sealants, fillers, paints & coatings, etc. Additionally, rising socio-economic factors along with consistently rising R&D initiatives in the electronics industry in the region has triggered product demand, as it is extensively used in the production of semiconductors, electronic chips, printed circuit boards, light emitting diodes, etc. Moreover, shifting focus towards unconventional energy sources, say solar energy in China, India and Japan will also help in propelling product demand, and thereby driving the market size in the forecast timespan. 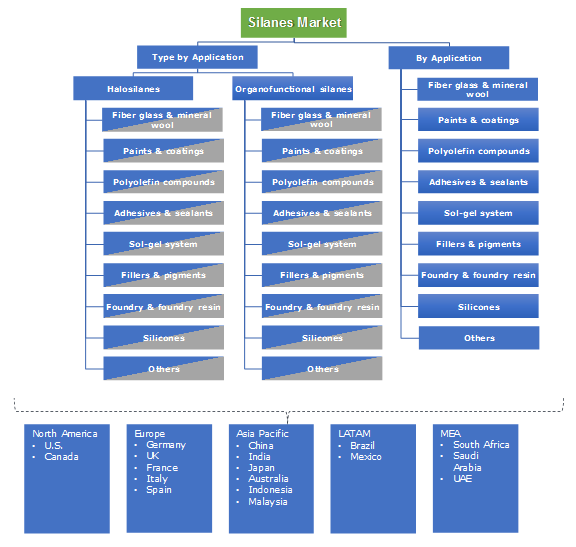 Silanes market share is highly fragmented due to prevalent number of large, medium and small scale manufacturing companies. Key prominent industry share players are Evonik Industries AG, ONICHEM, Dow Corning, Gantrade Corporation, Momentive Performance Materials, Air Liquide, Tokyo Chemical Industry Co., Ltd., among various others. Most of these players are expanding its production capacity to meet the rising product demand in the region and attain higher gains. For instance, Evonik announced to build a new silicone plant in Geesthacht, Germany in September 2018, with an aim to boost its overall profit margins and gain an edge over its competitors. Silanes are saturated chemical compounds which consist of one or multiple silicon atoms linked to each other or one or multiple atoms of other chemical elements as the tetrahedral centers of multiple single bonds. They find wide-ranging applications in the form of adhesives, sealants, fillers, pigments, paints & coatings, etc. owing to its excellent adhesion properties. 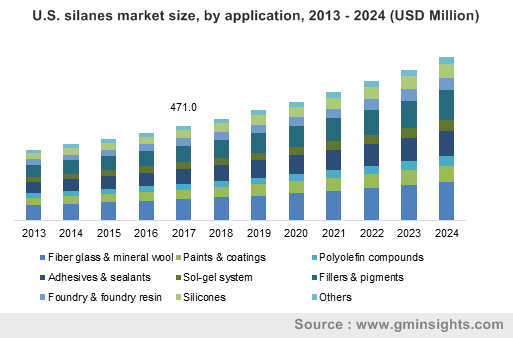 Rapid urbanization & industrialization in Asia Pacific and the Middle East will majorly contribute to rising product demand, which will help attain positive gains to the silanes industry size in the coming years. Additionally, rising socio-economic factors in the region has led to growing electronics industry which will have positive impact on the product demand, owing to its extensive application in the production of semiconductors and other electronic components.